Every day you repeat your new habit it becomes easier to continue. When you make a New Years resolution, you are saying that you want to make a change in your lifestyle. A change in lifestyle is no small undertaking. When you try to make a change, you realize that change is difficult. We are creatures of habit. It is easier for us to create a new habit than become more motivated. When you create a new habit, whether good or bad, your brain changes. These changes can be undone to stop a bad habit. They are also easily resumed because the foundation for the pattern is still there. This is very good news if you want to resurrect a good habit from your past. If you want to eliminate a bad habit, it will be more difficult. “It is as though somehow, the brain retains a memory of the habit context, and this pattern can be triggered if the right habit cues come back. This situation is familiar to anyone who is trying to lose weight or to control a well-engrained habit. Just the sight of a piece of chocolate cake can reset all those good intentions,” says researcher Ann Graybiel of MIT’s McGovern Institute. Neurofeedback can help to lessen the effect of triggers. Limiting the trigger helps to keep bad habits in check. This helps you make a change without being drawn back to your old habit. Creating a new habit is all about consistency. 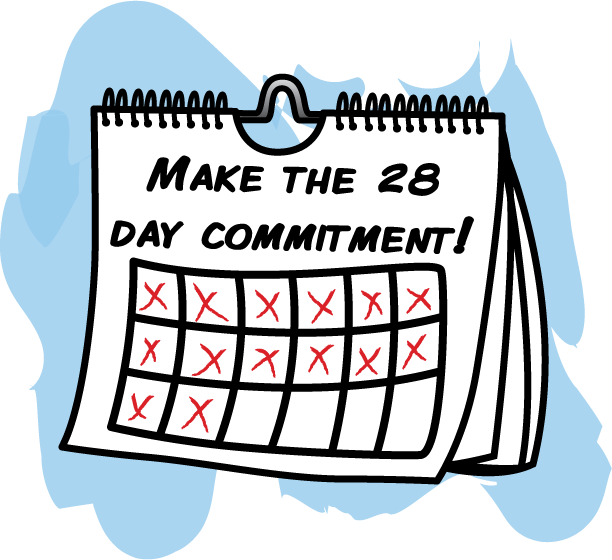 Studies show that if you can repeat an action every day for 21-28 days it will become habit. If you continue the habit for 66 days it will become a well ingrained habit. This is what you want. After you pass 21 days, you are over the most difficult part. Your new habit will be so easy to continue that you may reach the 66 day mark without even realizing it. 1. Start with an easy, specific habit. Practice with an easy change. It much easier to make changes that focus on healthy habits you would like to have than on bad habits you want to eliminate. Choose something like flossing before you brush or eating breakfast every morning. 2. Choose only one habit to create at a time. No matter how simple the habit is, don’t complicate your efforts. Stay focused on creating one habit. 3. Be serious about the habit you choose. You must be fully invested to make a change. The change must be important to you. Don’t decide to create a habit on a whim. If you are not committed to making a change, you won’t. Get excited about your new habit by listing the benefits you will experience. 4. 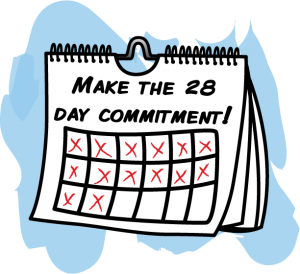 Make the 28 day commitment. Quitting is not an option.Put a calendar on your wall and mark the start date that you will begin to make a change and the 28 day mark when you will be “over the hump.” Mark off each day that you are successful and watch your calendar become a page of X’s. 5. Use visual cues. Visual cues are reminders that you can see. Put notes in places where you will be when it’s time for your new habit. Visual cues can be as simple as leaving floss next to your toothbrush. 6. Don’t change the time. Make sure that your new habit takes place at the same time EVERY day. Don’t put it off. If your new habit is part of a routine, don’t change the order. It must be the same every time. 8. Enlist support. Outside support helps you be accountable. Ask for help. Explain to your friends and family why you are making your new habit and what they can do to help. Now, look forward to having your new habit run on autopilot. Imagine how much more smoothly your life will run. Once you have one new habit in place, you can move on to others. As time passes, your new habits will take very little effort to maintain.